Home » Gurbani » Disrespect Of Guru Granth Sahib Ji » Beadbi (Sacrilege) of Guru Granth Sahib | Historical Gurdwara Sahib of Guru Gobind Singh Ji | Village Lamma Jatpura, Situated Near Jagraon. Beadbi (Sacrilege) of Guru Granth Sahib | Historical Gurdwara Sahib of Guru Gobind Singh Ji | Village Lamma Jatpura, Situated Near Jagraon. JAGRAON, Punjab—Another case of beadbi has come to the fore. This time, reports have been received from village Lamma Jatpura, situated near Jagraon. 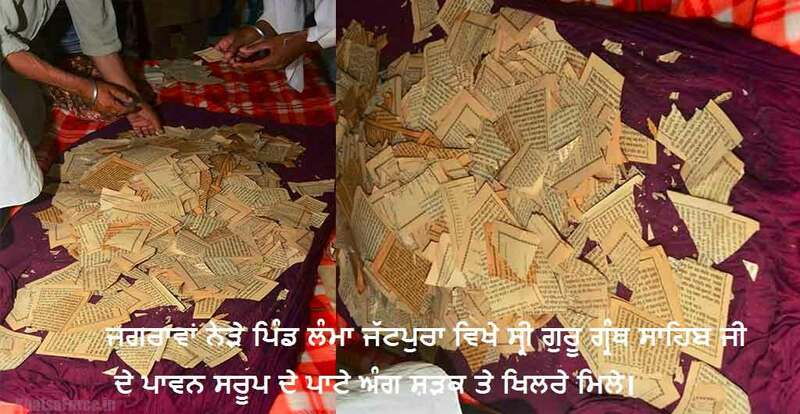 Guru Granth Sahib Ji’s angs were found separated from the saroop. Villagers came to know about the incident early in the morning when the torn angs were found scattered on the road leading to the Gurdwara Sahib. Sikh Sangat and youth in large numbers have now gathered outside the Gurdwara. Several members of Guru Granth Sahib Satkar Committee are also present, along with local police. Bhai Balbir Singh, a renowned parcharik based out of Lamma Jatpura also reached the spot immediately after finding out about the incident. “Sikh sangat is greatly upset over the incident in this historical village. No action will ever heal our sentiments, however, we urge the police to quickly nab the culprits so such incidents can be stopped in future,” he said. Bhai Balbir Singh is a former Sikh political prisoner who was arrested was fabricated by the Punjab Police under the notorious Arms Act. Lamma Jatpura is located just 20 kms from Jagraon. There are several historical Gurdwaras established here in memory of Guru Gobind Singh Ji.